Thank you for visiting Custom Garage Works! 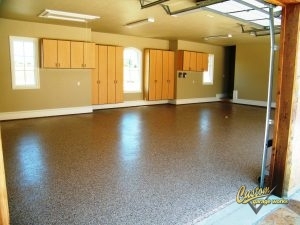 In 2003, we began offering top quality garage floor coating in Haslet, TX after we wanted more out of our own garages. We set out to create the perfect garage for ourselves and our growing families, but when we couldn’t find what we were looking for within the existing industry, we decided to jump in ourselves. Now, we proudly offer professional garage organization solutions, along with top-of-the-line polyurea polyaspartic floor coatings, that have a significantly longer lifespan than epoxy. We are committed to excellence, and we are passionate about providing premium garage floor coating and custom garage solutions throughout the DFW area. 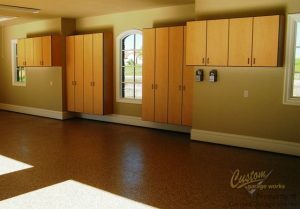 Our premium garage floor coating in Haslet, TX is one of our most common garage services! This coating is so popular because it is both more durable, and cures faster than traditional epoxy. Thanks to it’s tough composition, our polyurea-based floor coating is resistant to changing color and failing that can occur with epoxy. Since we only use a diamond grinder to prepare the concrete for coating, as opposed to acid etching, we can provide a higher quality end result. If you’re looking to learn more about our reliable garage floor coating services, give us a ring at 214-494-9068 or 817-308-1305 and schedule your free estimate! And More! Discover more about our variety of custom floor coatings, and decide which one will work best for you! Thanks to Custom Garage Works’ storage solutions, you won’t ever need to worry about running out of space in your garage again. We know that a brand new garage floor looks best when it isn’t covered by other items in your garage. We provide a variety of solutions to organize your belongings, including overhead storage racks and garage cabinets. We carry some of the most resilient overhead storage racks in the industry, and our garage cabinets are specifically designed for garage needs. For a dependable garage floor coating in Haslet, TX that will last for years, and an organization solution that cannot be beat, you can rely on Custom Garage Works! Overhead Storage Racks When you want to get more from your overhead storage space, our overhead racks provide resilient and dependable storage. Storage Cabinets These bulldog cabinets are unlike any other garage cabinets you will find in this area, thanks to their extreme durability. Car Lifts Are you almost out of space for your vehicles? Our garage car lifts can help! And More! Our organization services are affordable and effective ways to improve the aesthetic and feel of your garage.